Our completely authentic replica of this historic 20th Century rifle includes its signature short magazine and a working bolt-action mechanism. Ideal for reenactors and infantry drill teams. SMLE HISTORY: The Lee-Enfield was the British Army's standard bolt-action, magazine-fed, repeating rifle from 1895 until 1956. It was adopted by Britain's colonies and Commonwealth allies, including India, Australia, New Zealand, and Canada. After the war, it became a popular civilian hunting rifle, after being "sporterized"--often fitted with scopes, or replacing military sights with high-quality commercial varieties. The Short Magazine model of the Lee Enfield was introduced in 1904. Shorter and lighter than the first Lee Enfield rifles, it had a barrel that was midway between the original "long rifle" and the shorter carbine. Its visual trademark was its "blunt nose", with the barrel extending beyond the nosecap. 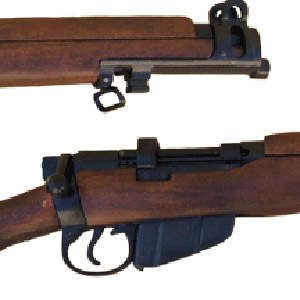 The shorter Lee Enfield also incorporated a charger loading system--an innovation borrowed from the German Mausers used by South African Boers. Some experts at the time felt it was a bad fit all around--too short for cavalry and not long enough for the accurate, long-range fire needed by massed infantry. Still, the Short Magazine Lee Enfield was serviceable enough to remain in official service for British troops until 1956, and some British Commonwealth nations still use them to this day. Used by British troops in both World Wars, the Short Magazine Lee Enfield merits a place in any collection of British weapons of war. #22-54 - Replica bullets for loading your SMLE rifle clip. Your state laws specify that replica guns can only be shipped to California or Kansas if they are part of a framed or boxed display, so we add a 45" wood mounting board to your order, sold at our cost plus shipping for the added weight of the board, to comply with that law.